This recipe is one that I have re-created from a one-off childhood memory of some beautiful, heavenly Strawberry Choux Buns. My mother made them for my grandmother’s coffee morning when we were staying with my grandparents one summer in Denmark. There was no actual recipe, she just put them together from her own inspiration. To my knowledge she never made them again but they were so wonderful, the memory of them lived on. I recall sneaking to the fridge before the party and thinking, they won’t miss another one will they. To me they were the best thing I had ever tasted! 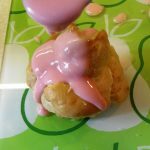 The thing that set these Choux buns apart from any I’d ever had before, was the delicious strawberry icing and the crushed strawberry and whipped cream filling. The first person to try one of my buns was my daughter’s piano teacher and she loved it. My children and husband also loved them which was just as well as I made far too many (22) and even had to do a mercy dash to my parents to distribute the booty. 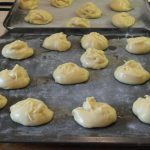 Therefore in the following recipe there is enough dough for 24 but filling for just 12 with the idea that you freeze the other 12 buns for the future (they thaw rapidly). Why not invent your own topping/filling for the rest! 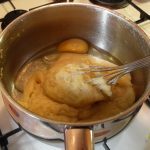 The basic choux recipe has been adapted from a Herald Series article by Helen Peacocke. After melting butter with water immediately tip in flour and salt. Beat well to form dough then add eggs one at a time. Beat again until you have a glossy paste. Spoon or pipe onto greased and floured baking trays. After baking cool on wire rack. Fold the icing sugar and strawberry pulp into the whipped cream. Make icing with icing sugar and strawberry juice. 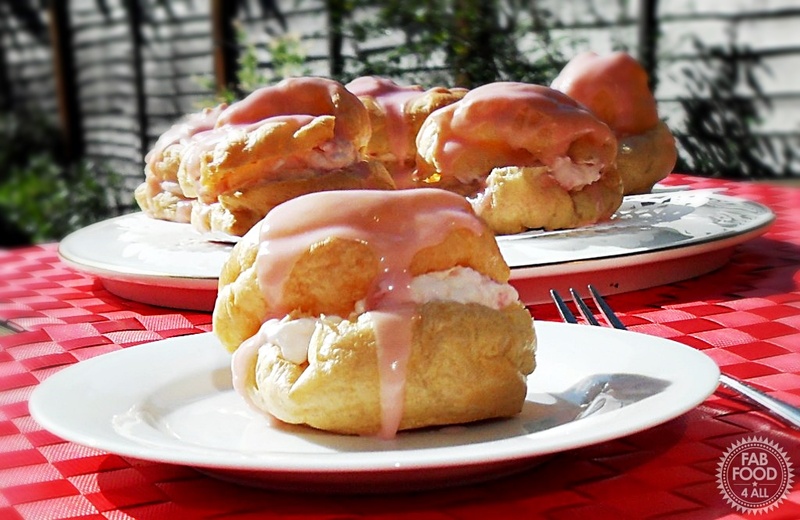 Spoon icing onto choux buns. 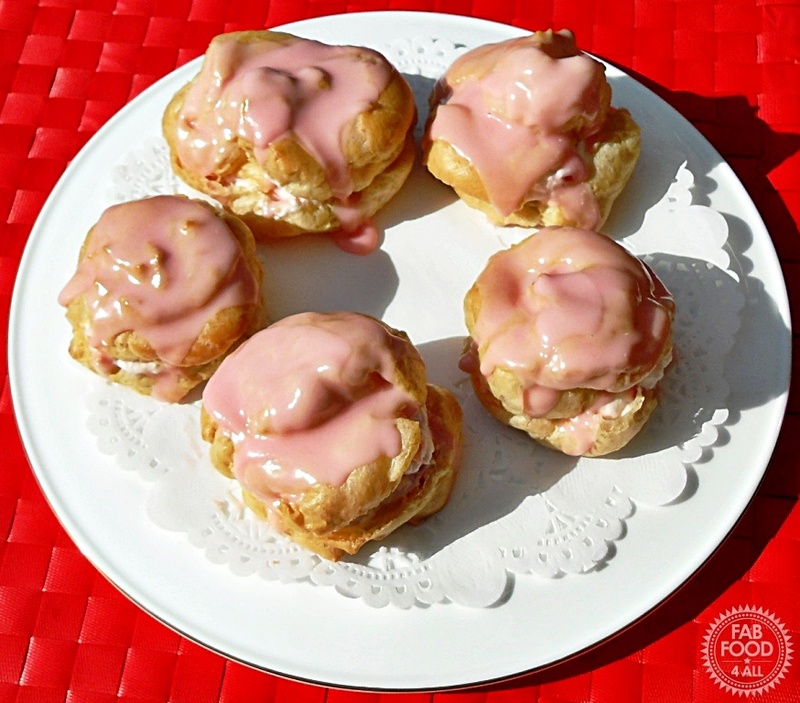 Strawberry Choux Buns with strawberry cream filling and strawberry icing – heaven on a plate! Preheat the oven to 220C/425F or gas mark 7. Grease and flour a 2 large flat baking trays to prevent the buns from sticking as they cook. 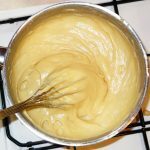 Place the water and butter into a saucepan and heat until the butter has melted. 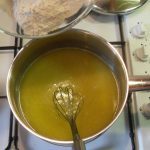 Using a whisk mix in the flour and salt, and beat really well over a moderate heat until the mix begins to form into a soft ball. Remove from the heat and beat in the eggs one by one. At this stage you should have a smooth shiny paste. 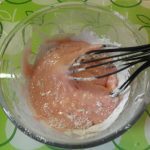 Using a couple of spoons or a piping bag, place rounds of the paste on the greased tray. Size is up to you, as long as you remember that if cooked properly, they will double in size, so leave enough room for them to expand. Bake in hot oven for ten minutes and then, without opening the oven door, turn the heat down to 190C/375F or gas mark 5. Leave to cook a further ten minutes before carefully opening the oven door. 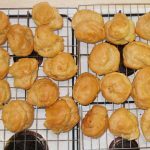 When the choux buns are golden brown and puffed to twice their original size, they are done. For best effect, turn the oven off when they are done and make an incision in the side of each bun then allow them to remain in the oven with the door open for another ten minutes to dry out. Then slide off onto a wire rack. Now whip the cream and fold in the icing sugar and crushed drained strawberries. Reserve juice. Fill by spooning in the strawberry whipped cream and then replace the lids. To make icing, put icing sugar in a bowl and stir in reserved strawberry juice in 2-3 lots and spoon over the choux buns. For more strawberry inspiration check out my other strawberry recipes! 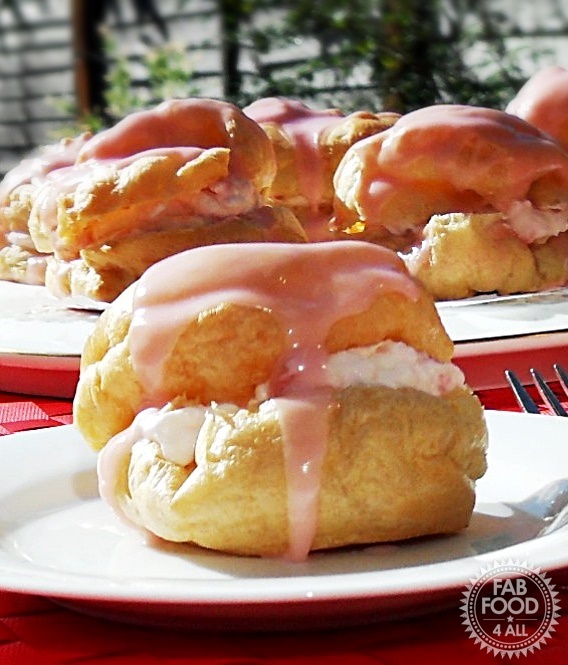 Great looking recipe, I love choux buns so much. Hi just trying these. Recipe says 570mls water or half a pint. I used 570 mls which I now discover is way more than half a pint and my flour butter mixture never formed a ball. Now wondering whether to abandon them completely or just add egs and see how they go? Oh these sound incredible. Wowee. As they have strawberries i’m going to count it as one of my five a day !